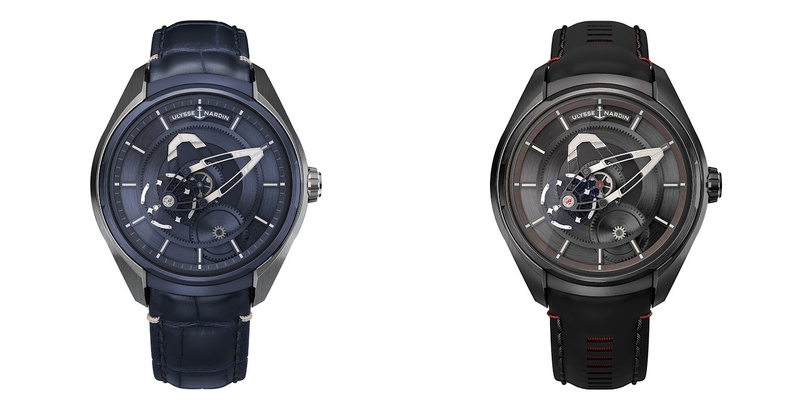 Since its introduction in 2001, the Freak has consistently been a focus of innovation for Ulysse Nardin. This year, the innovation comes in the form of the new Freak X, a new entry point into the Freak family. The new model differs from all previous Freak timepieces in two key ways: it is smaller (a new more rounded 43mm case instead of 45mm), and it features a traditional crown for time adjustment. This is moving back to convention, away from the crown-less original wherein time correction is via the bezel, a feature that made it so groundbreaking and which is still a feature of the models based on the original. The ‘baguette’ movement is unchanged i.e. a carousel, turning once on itself every hour to indicate the time. With no dial or hands, the central bridge acts as a minute hand and one of the wheels indicates the hours. Both are treated with Super-LumiNova, as are the indices. The new Calibre UN-230 is an automatic movement rotating around its own axis once every hour, with a silicium balance wheel and nickel flyweights . It is an amalgam and reworking of the Calibres UN-118 and Freak Vision UN-250, beats at 21,600VPH, and has seventy-two hours of power reserve. There are two other main points of note apart from the smaller size and crown – the introduction of Carbonium®, as a case material (a first in the industry), and its entry price. The new Freak X is available in titanium with a PVD finish, 5N rose gold/ titanium with black DLC, and matte-finished Carbonium®, with titanium with black DLC. Carbonium® is a composite material made from gold particles and 7μm aeronautical grade carbon fibres. The latter are twice as light as aluminum, and 95% sourced from carbon by-products used in the aeronautical production industry. As well as being light, it is also tough (and thus has good scratch resistance) and has an interesting texture visually. 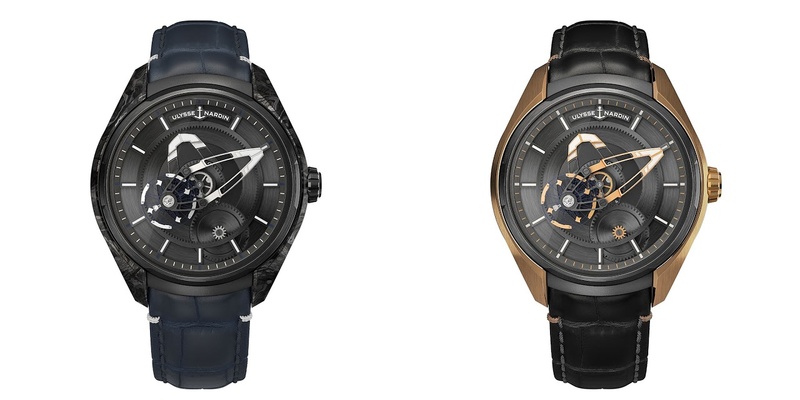 The process development used to turn the carbon by-products into this composite is, according to Ulysse Nardin, based on three patents led by Lavoisier Composites. So how much for these new entry level Freaks? Both the Freak X 2303-270/03 Titanium with PVD ‘Blue’ and the 2303-270.1/BLACK Titanium Black are 21,000 CHF, the Freak X 303-270/CARB Carbonium is 24,000 CHF, and the Freak X 2305-270/02 5N rose gold/ titanium with black DLC is 30,000 CHF. Retaining the cool factor of the model, and by far the most affordable Freaks to date, these are a very attractive proposition for the many who have wanted to enter the Freak zone but not been able to do so.